This video lecture explains the pins and wiring in Ethernet cables and RJ45 plugs. We look at the 568A and 568B color codes, what they mean, and why they're important. We also discuss when and why to use a straight-through Ethernet patch cable color versus an Ethernet crossover cable wiring color code. 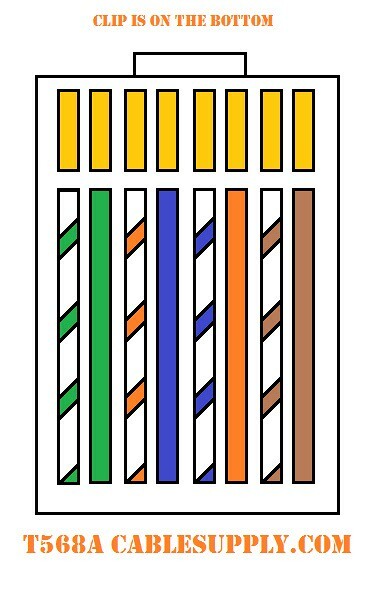 Ethernet cable Color-coded wiring sequences exist as a cabling industry standard. It allows cabling technicians to reliably predict how Ethernet cable is terminated on both ends so they can follow other technicians' work without having to guess or spend time deciphering the function and connections of each wire pair. Ethernet cable jack wiring follows the T568A and T568B standards. There is no electrical difference between the T568A and T568B wire sequences, so neither is inherently superior. The only difference between them is how frequently they are used in a particular region or type of organization. So, your choice of color code - which one is "right" - will largely depend on the country you work in and what types of organizations you install for. Either standard is acceptable in most cases. You can use either one as long as you're consistent. When entering a new job, you may want to take a look at any pre-existing cabling to see which standard is already in use at that location. 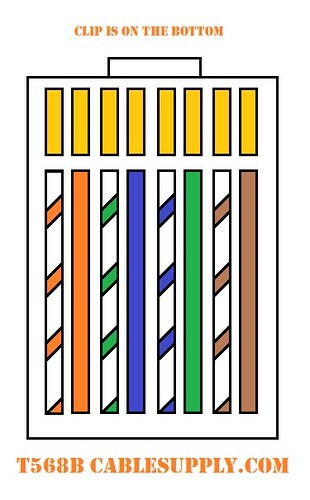 T568B is the standard followed by the majority of Ethernet installations in the United States for RJ45 color code. It is the more common standard used when cabling for businesses. T568A is the majority standard followed in European and Pacific countries. It is also used in all United States government installations.